Shame on me for jumping to conclusions. 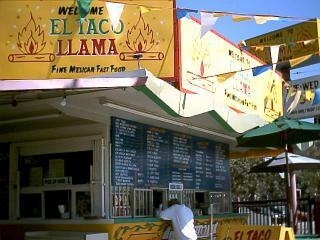 I've recieved enough email from people saying that indeed the El Taco Llama on Magnolia in NoHo is still open. 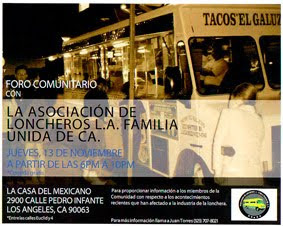 So I suggest everyone head on over there and try the carne asada and al pastor and their killer salsa roja. Bandini: I work in Century City. It feels like the black hole of good Mexican eats: I've been forced to go to Baja Fresh. I know Eduardo's on Santa Monica and Westwood. ANY OTHERS PLEASE??!!!? Preferably more taco truckish. Thanks for the update and for the continued great work. century city is a taco wasteland. If you're looking for a taco truck there's one that parks during the day at the corner of overland and pico in front of the washington mutual. I havn't been there yet but it has been recommended to me. I went to ETL on Magnolia yesterday and it was definitely open. 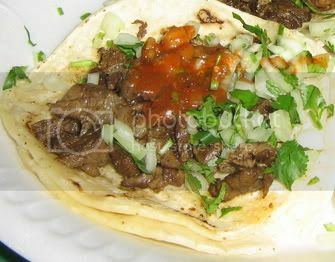 I have to go to Tacos La Fonda asap, because the ETL tacos were the best I've ever had. The asada was perfectly charred and flavorful, accented wonderfully by the smokey kick of the salsa rojo, and the al pastor was flavorful and succulent. They totally blew away the ones from Tacos El Zorro. Ate at ETL yesterday. And check out the carnitas some time.